St Thomas the Martyr, Bristol. 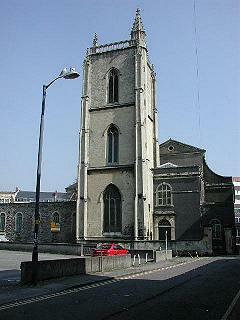 The church of St Thomas the Martyr, a chapelry of Bedminster, served that part of the town's early expansion south of the Avon and within the later defences. It was built not long after the archbishop's murder in 1170, and was described as being a large and elegant building as early as 1200. This was a parish full of rich clothiers - an important market was started at the time of Queen Elizabeth - and much money was given to it. Before the completion of St Mary Redcliffe, members of the influential Canyngyes family had been buried in St Thomas, and Sir William Penn, founder of Pennsylvania, was baptised there. The present church was completed in 1793. 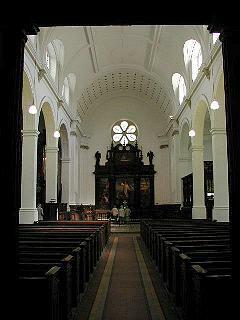 In 1818 the historian Dr John Evans wrote, 'The architecture of the present church contains little that will offend a correct taste, though it combines nothing to excite admiration ... a specimen of what has been denominated the modern style of ecclesiastical architecture.' The Perpendicular north west tower is mostly original. 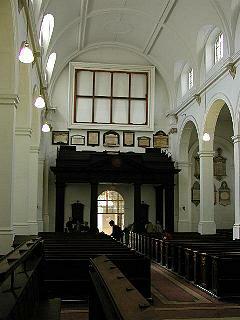 The interior of the church is Georgian. The combination of high barrel vault ceiling and clerestory windows with painted plastered walls contribute to the spaciousness and light of the interior, leading the eye to the richness of the reredos at the altar. At the end of the 13th century Simon de Burton established an almshouse in nearby Long Row. Rebuilt at various times, it was destroyed during the Second World War, but a couple of small statues from the building are displayed in the church. 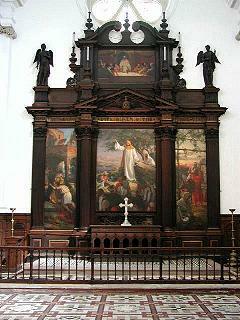 The one shown is of St Thomas himself. St Thomas itself survived the bombs but the area around changed out of recognition. Most of the surrounding streets no longer held houses and land was being covered by office blocks. Although there was still a large and faithful congregation, when the Rev Marwood Paterson retired in the late 1940s, no new vicar was appointed. It struggled on under various 'experimental' systems for several years, but in the 1970s it was decided that there was 'no viable future for St Thomas as a church'. The last service was held there at Christmas 1982. The church is now administered by the Churches Conservation Trust. 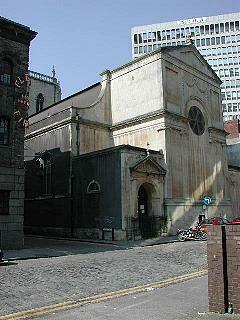 See the Churches Conservation Trust web site here, and Bristol Web. The west gallery (not shown!) 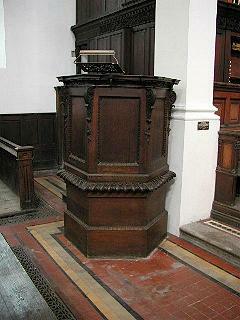 dates from 1728-32, and was originally in the previous church on the site. Bristol, Bristol, St Thomas the Martyr, 8, 29-0-0 in D.